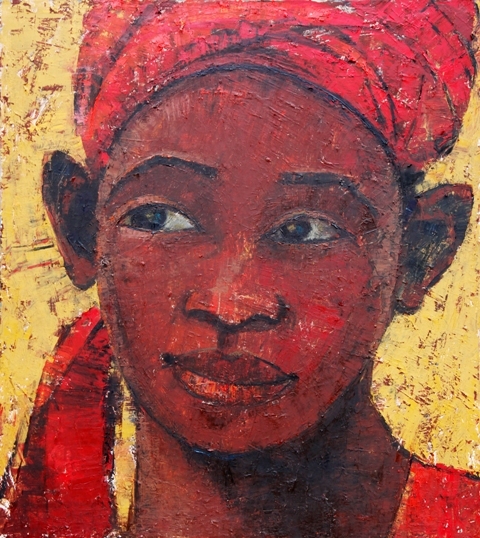 In recent years, a fertile artistic landscape has been evoked on the Nigerian art scene. A shift, E. Okecukwu Odita, professor of the History of Arts, Ohio State University says is “fast becoming a topic of eager discussion in national and international circles.” A discourse that is certain to continue with the publication of A Celebration of Modern Nigerian Art – 101 Nigerian Artists by Chukwuemeka Bosah and George Edozie. It is the first of its kind in a series of books to historicise contemporary art from Nigeria and other parts of Africa. 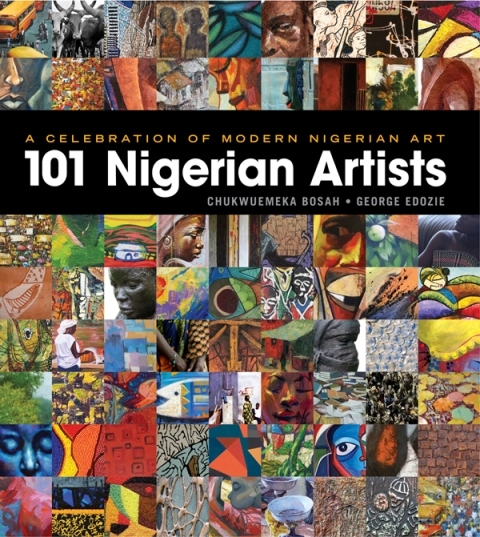 Published by Ben Bosah Books, Volume 1 of A Celebration of Modern Nigerian Art – 101 Nigerian Artists documents the artistic creations: Paintings, sculptors and photographs of 101 artists, all Nigerians and living artists, at home and in the diaspora. It features work by the likes of Babalola Dare Lawson, Alex Nwokolo and Okezie Okafor, revealing a diversity of work that is testament to the emergence of an artistic movement which has been overshadowed by the lack of exposure. It has been described as a ‘rich harvest and gallery of known and little known artists’ which serves as a historic encyclopaedia of contemporary Nigerian art. In our interview, Bosah explains what compelled him to put the book together and why it is important to document the history of a nation’s art heritage. Belinda: What compelled you to put this book together and how did the project come about/evolve? Chukwuemeka Bosah: As an observer and what I term a minor collector of art, especially from Nigeria and of Nigerian artists, I noticed a gross under-representation of their work in major galleries and museum. This is particularly true of the younger artists. Belinda: Why is it important to historicise/document art work like you have done with this book? Chukwuemeka Bosah: Well, since no such publication existed, I felt the need to feel the void, and remove one of the impediments preventing the exposure of the artists from Nigeria, who are doing work as contemporary as their peers in other parts of the world. This book provides curators one more tool to learn about Nigerian art and artists. Belinda: Are all the artists featured in the book living artists and are they all based in Nigeria? Chukwuemeka Bosah: About ninety percent of the artists featured in the book live and work inNigeria. We have at least one in the UK, another in China and about seven of them living in theUnited States. At the time of the publication, all the artists featured were living. That is also the case as of this time. All but a couple of them were 50 or younger at the time of the publication. Belinda: How would you describe the current state of contemporary art in Nigeria? Chukwuemeka Bosah: Vibrant. With the emergence of well-heeled Nigerian collectors, most with a fine eye for quality work, the art that is presently being produced by Nigerians keep improving with new work coming that goes beyond the figurative art that is mostly associated with art from Nigeria. Belinda: And how well is the contemporary art scene received and respected in Nigeria or is there a lack of appreciation for it? Chukwuemeka Bosah: The art scene in Lagos and Abuja is quite sophisticated and that happens to be where most of the events surrounding art and artists take place. A lot of work needs to be done to increase the appreciation of art and artists in other parts of Nigeria. Part of our mission is to make this happen by spreading the message with our books and events around the country. The National Gallery of Art and other governmental and non-governmental organisations can do much more to support artists and people like me achieve their mission of enhancing the appreciation of art in the country. Belinda: How did you pick the artists who are featured in the book and why did you select their work? Chukwuemeka Bosah: We issued a call for submissions, and gave the artists a month to submit their work electronically by email. We ended up extending by a week. Because we needed to have quality reproductions, we assisted some artists in having their work professionally photographed. It must be mentioned that while overall the quality of the art was excellent, one could not say the same for the photography of the work by some of the artists. Since reproducibility on paper was the primary criteria, a lot of the artists whose work may have been featured were dropped from the final list we supplied to our jurors. There were four jurors who were responsible for selecting the artists. Belinda: Is there a big collector art base in Nigeria and is this reflected in other parts ofAfrica? Chukwuemeka Bosah: I will say it is a growing base. They are not as much as you’d find in western countries, but most of them are prodigious collectors, especially the ones around Lagos. I’d say that about eighty to ninety percent of the Nigerian collectors reside in the Lagos metro area. I cannot speak about other parts ofAfrica, since I do not know very much about that. Belinda: Are there plans to repeat the same book which collects the work of artists from any other African nation by you? Chukwuemeka Bosah: Yes, presently, we are doing preliminary work necessary to complete a book on Ghanaian artists. We hope to release the book in time for their fifty-second independence celebration in 2012. I have been approached about doing a book on contemporary artists of Benin (the country) by Talle Bamazi, an artist based in the United States. If we can find the right partners, we intend to do similar books for countries like South Africa and Ethiopia. Belinda: What did the work of the artists featured in the book communicate during the process of selection that made them the right candidates for the book? Chukwuemeka Bosah: I had no direct involvement with the selection of the artists in the book. However, in my own collection, there are lots of figurative works, as well as a few that not only are aesthetically pleasing but provide a commentary on the goings on in Nigeria. Belinda: Why do you think Nigerian artists don’t get the kind of support you have been able to give to those featured in this collection you have presented as a book? Chukwuemeka Bosah: My sense is that it stems from lack of art appreciation in the country. I hasten to add that gradually we are seeing an improvement, however there needs to be much more corporate and governmental involvement to elevate visual arts to its place in society. As a resident in the western world, you recognise the kind of support provided to the arts and artists. In Nigeria, we have a long way to go, but we also have a greater opportunity. Belinda: What has the response to the book been like since it was published? Chukwuemeka Bosah: Given the limited marketing of the book, the response has been nothing short of phenomenal. Our partners have been happy, as well as the Nigerian public and the artists themselves. The book is a limited edition book, and on Amazon, the prices of used copies have shot up to close to one thousand dollars. It is a trailblazing book, and I suspect that you will see a plethora of books on contemporary Nigerian art soon. I say the more, the merrier, and the artists benefit. Belinda: Any future editions of 101 Nigerian Artists? Chukwuemeka Bosah: (Laughter). Yes, of course. We would be doing another volume of the same book in 2012, and lots of artists, especially the cynical ones who elected not to participate the last time are now lining up ready to make submissions. Since the number of artists will stay the same, you can imagine the competition already shaping up for 101 Nigerian Artists – The 2012 edition. It is all very exciting. This entry was posted on Thursday, December 8th, 2011 at 2:34 pm	and is filed under Africa, African Diaspora, Art and Culture, Interviews, Journalism, Nigeria. You can follow any responses to this entry through the RSS 2.0 feed. You can leave a response, or trackback from your own site. I want to say well done to Mr Bosah for his hard work in putting this book together. I love art and anything to raise awareness of African arts is a good thing. Thank you. I shall be picking up a copy soon. Great course..with a ‘for-us-by-us’ mindstate! Nice 1, Mr. Bosah. Nice Interview Belinda. It feels good to grace the 100th page of the book. @ Ibe, thanks for stopping by and sharing your thoughts. Yes, saw your work in there and it looks great!